This is an interesting area near the Los Angeles Airport, combining a unique and scenic trail along Ballona Creek and wetlands and a run along the beach in Playa Del Ray. There are numerous options here, including Ballona Creek bike path, and then along Dockweiler State Beach. 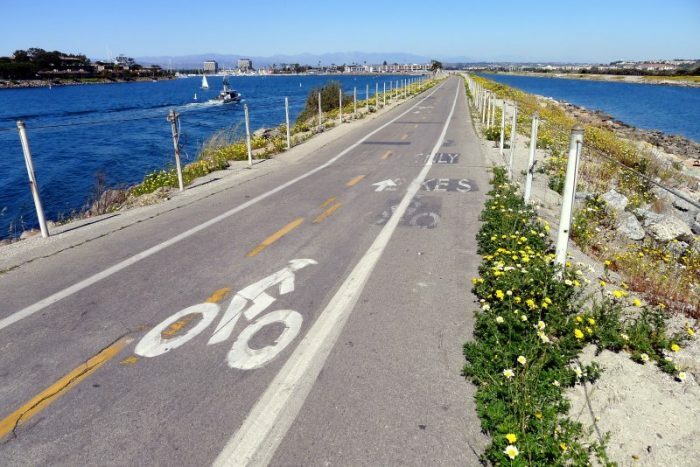 The Ballona Creek bike trail follows the channelized Ballona Creek for 7 miles, from Syd Kronenthal Park in east Culver City (National Boulevard) to the Pacific Ocean, where it heads south to Dockweiler Beach. Along the way the trail passes through residential neighborhoods and then opens up into the Ballona Wetlands, with vistas and wildlife viewing. The path can be accessed off of many of the major streets. Our route starts in the wetlands preserve at Lincoln Blvd., continues along the trail, and then along the beach to W. Grand Ave. Runners can of course do any of this route or access it at any point. The 5.2 mile one way route starts the wetlands preserve at Lincoln Blvd.